For the first time in is 30-year history the Dakar Rally crossed the Atlantic Ocean for the deserts, mountains and rocky terrain of South America in 2009. This is the full, action-packed story of a 9,500km journey through Argentina and Chile which wrote a new chapter in the story of the World’s greatest motorsport adventure. 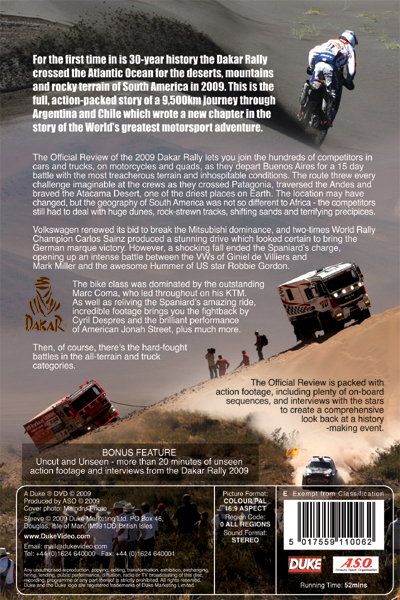 The superb footage captured in this official review of the 2009 Dakar Rally lets you join the hundreds of competitors in cars and trucks, on motorcycles and quads, as they depart Buenos Aires for a 15 day battle with the most treacherous terrain and inhospitable conditions. The route would throw every challenge imaginable at the crews as they cross Patagonia, traversed the Andes and braved the Atacama Desert, one of the driest places on Earth. Volkswagen renewed its bid to break the Mitsubishi dominance, and two-times World Rally Champion Carlos Sainz produced a stunning drive which looked certain to bring the German marque victory. However, a shocking fall ended the Spaniard’s heroic efforts, opening up an intense battle to the finish line between the VWs of Giniel de Villiers and Mark Miller and the awesome Hummer of US star Robbie Gordon. The bike class was dominated by the outstanding Marc Coma, who led the way throughout on his KTM. As well as reliving the Spaniard’s amazing ride, our incredible footage brings you the fightback by Cyril Despres and the brilliant performance of American Jonah Street, plus much more. Then, of course, we also have the hard-fought battles for honours in the all-terrain a truck categories. The Official Review is packed with action footage, including plenty of on-board sequences, and interviews with the stars to create a comprehensive look back at a history-making event.